When the great thoroughbred Secretariat won the Triple Crown in 1973. A few years ago, I learned that Disney was making a movie about Secretariat. So I went to the archives and resurrected an old, old design that I had done years ago. 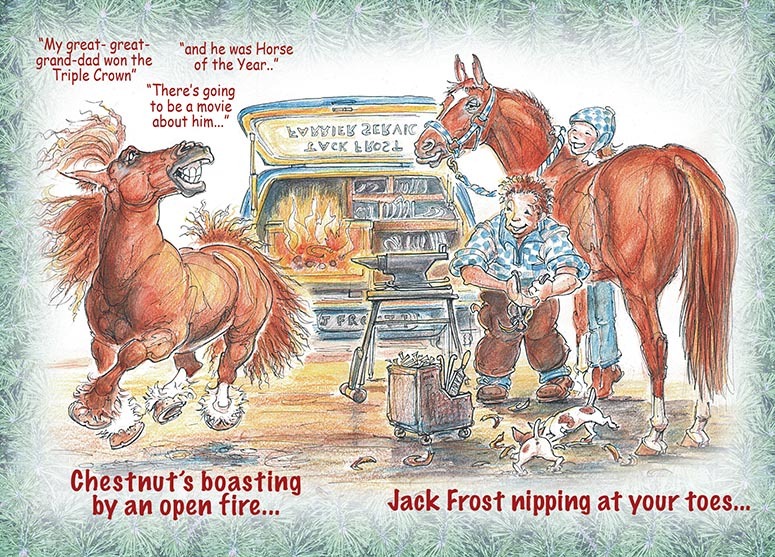 A fun twist on the Christmas Carol - our Chestnut is BOASTING - not roasting... and the Jack Frost happens to be the farrier - of course, he's NIPPING ON TOES! (groan) Lesley Bruce revamped the art for us - with wonderful little details only she can muster - right down to the Jack Russell Terriers undefoot vying for the hoof trimmings. The back of the card includes some trivia about Secretariat, and a little blurb about the movie. This one is a huge hit with farriers and horse owners alike.